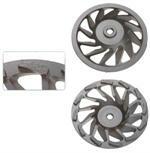 Shop U.S. Diamond Tool for the best selection of diamond cup grinding wheels! When it comes to concrete grinding wheels, we offer a large selection to choose from for whatever project you’re trying to tackle! 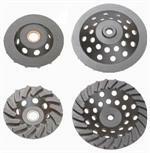 All of our grinding cups can be used wet or dry, on concrete, masonry and stone surfaces! 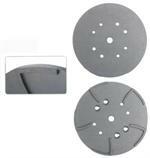 They’re available in a variety of rim sizes from 4”-7” diameter. At U.S. Diamond Tool we also offer a variety of grinding disk plates for applications like concrete, masonry and asphalt. Our concrete grinding wheels are designed to smooth any surface in record time, without the labor intensive use of chemical treatments to remove stains or smooth an uneven surface. 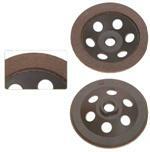 We also carry metal grinding wheels for more intense jobs, which require a heavier tool. Contact U.S. Diamond Tool’s customer service department at 800-582-1429 with any questions regarding our diamond cup grinding wheels!